We welcome you to our house where you can feel at home. In the former Border Watchtower, hidden in the Orlickie Mountains, you can really relax. 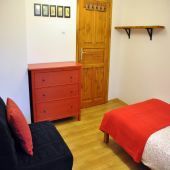 We have 4 comfortably furnished apartments with bathrooms and kitchenettes at our guests disposal. In addition, there is a playroom for children, library, gameroom, and hearthside Room in the Basements of the Forest Watchtower. 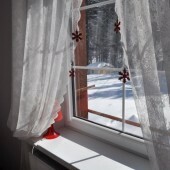 The house, in which our Apartments are located, is set in beautiful, forest area of Zieleniec, 50 metre's from a road leading from Zieleniec to Duszniki Zdrój and Lasówka. The house a former Border Watchtower, is very atmospheric and almost a hundred years old. 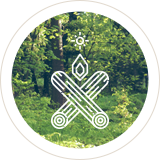 The Forest surrounding provides silence and peacefulness, which provides relaxation away from hustle and bustle. It is a perfect place especially for families with children. This place is beautiful in every season of the year. You can spend an evening barbecuing or sitting close to the bonfire in the garden. 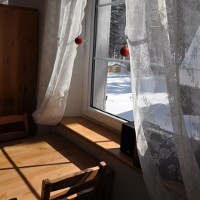 In the winter, it is great accommodation for ski lovers. In addition, there is a Ski room in the house. An innovator. An enthusiast. 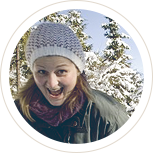 She is fond of Astrid Lindgren’s books and hitting the road. She cooks (from time to time), but more often she improvises. Initiator of the project Forest Apartments in The Watchtower. Originally she is an architect, but by vocation she is a chef. She bakes, stews, blanches. She is the Seeker of New Flavors, culinary non- conformist. She likes needlework and making something out of nothing. She is especially fond of black French bulldogs. 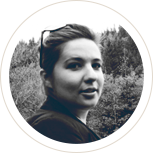 TARKI - A practicing physiotherapist with a distinctive rock vocal. Once a restless spirit, now he is exemplary father and husband. He is a beekeeper as was his grandfather. He doesn’t keep off jokes, he hates bungles, and he is never in bad mood. 1930 The building in which the Forest Apartment are located, was built in 1930 with two adjoining houses as a residence of the Troops of Defense of the Borderland. At that time, Zieleniec was named Grunwald. There were German Troops in the Watchtower up to the end of the Second World War. 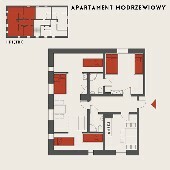 1945 The building became Polish troops’ property, and it still is used as a residence of the Troops of Defense of the Borderland. 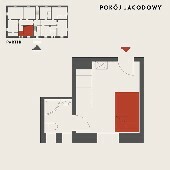 Rooms of the building were used as a wheat, food, and uniforms warehouse. There was also an arsenal and arrest for people crossing the border illegally. In the garden there were underground fuel tanks and great radio mast. 2007 After many years of serving as a residence, the military unit was abolished, and the soldiers left the Watchtower. 2012 The Watchtower became a private property, and tedious and exhaustive renovation begun. 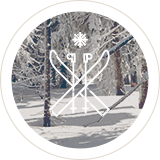 2013 The Watchtower opened its door to guests, and the Forest Apartments were created. * Rates for 1-7 days stay. * Charge for bedding included. This big apartment (78 m2) consist of 3 bedrooms with bathrooms, a foyer, and a freestanding dinning room with a TV set and a kitchenette. 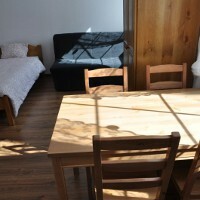 In the dining room there are 2 tables and chairs, 2 cozy sofas, a bookcase, and a TV set. 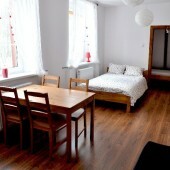 In the biggest room (for 4 people) there is a double bed and 2 single beds. In the next bedroom there are 2 twin beds. 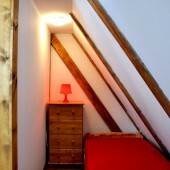 In the smallest one (for 3 people) there is a 1 single bed and 1 twin bed. 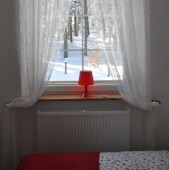 The windows of the apartment looks out North, South, and East. 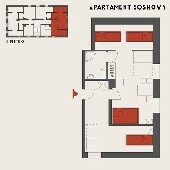 The apartment is designed for 10-11 people (up to 3 families). 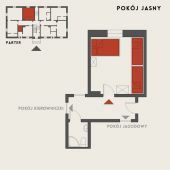 This spacious apartment (68 m2) consist of 2 bedrooms, 2 bathrooms, a foyer and a dining room with a kitchenette. There is an option to watch the TV in the dinning room. 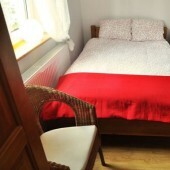 In the main bedroom there is a double bed and 3 single beds. 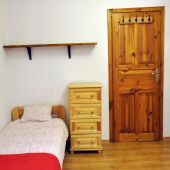 In the smaller bedroom there are 2 twin beds and 2 single beds. 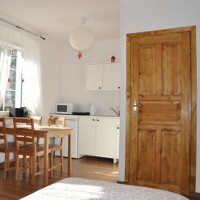 The apartment is located on the first floor, and it is perfect for 8 people (2 families). 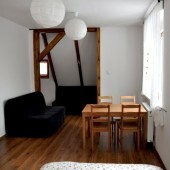 This Apartment (45 m2) is very cozy, under the pitched roof. 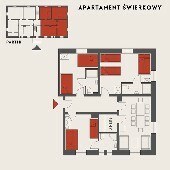 There is a big room with a kitchen-diner, 2 bedrooms, and a small foyer. In the main bedroom there is a twin bed. 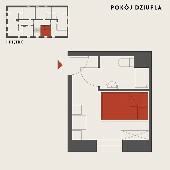 In the other bedrooms there are 3 single beds. 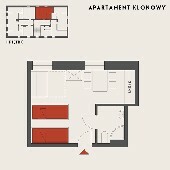 One-room studio (22 m2) with a kitchenette. It is located on the ground floor, in full light, with windows looking out South. 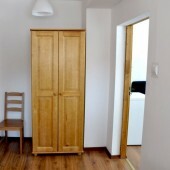 It is designed for 2-4 people (2 single beds and one convertible sofa). 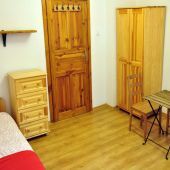 This room for 2 people, with a bathroom and a double bed, is the smallest (10 m2) of all the rooms in the Apartments. 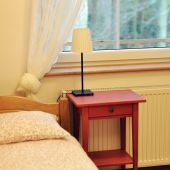 It can be a supplement of the Apartment of Pine, Larch, or Maple, because it is located on the same floor, in the close neighborhood of the above mentioned apartments. 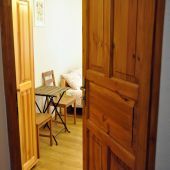 This room (20 m2) for 4 people, with a bathroom accessible from a hall, is called the Bright one, as it is the only one where there is natural, whitewood pine furniture. 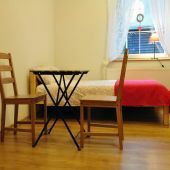 There is 1 twin bed and 2 single beds, and located on the ground floor. A room for 2-3 people with a bathroom called the Berry one. There is a double bed, and a convertible sofa for one person. It is located to the opposite of the Bright Room. 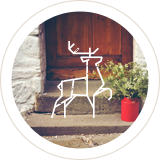 If you require an invoice, please, contact us in advance. Please note, if cancelled up to 30 days before date of arrival, no fee will be charged. If cancelled later or in case no-show, 100% of down payment will be charged. 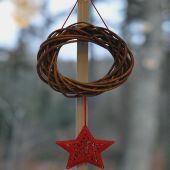 In the whole house there is a free Wi-Fi. The hotel day lasts from 5 PM to 11 AM of the next day. Our Guest can pay in cash or by transfer. We do not accept credit cards. For each full day, during the stay, longer than one day, we are taking 3.50 zł of local payment according to the Resolution of the City Council of Duszniki Zdrój. The payment is expected to be paid in cash during the checking in. On request, we provide parents with a travel cot for children, a bathtub, a high chair and a babyphones for free. We do not charge little children (under 4 years old) sleeping with parents or in its own bed for staying. 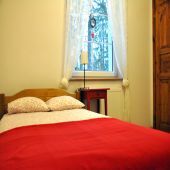 Extra bedding or bedding for children under 3 years old is charged 15 zł once. Charge for domesticated animals - 10 zł/animal/day. Parking (at the house) is free of charge. In case the map is not working, please go directly to Google Maps (here). A copy would be sent to you. Do you want to know what is happening here, in The Forest Apartments? Our letters are being received by all of those, who are interested in us. We write them so you can smell the forest for a moment. This is not spam - it is The Forest Mail.